YANGON – Fifty-six-year-old father-of-two Bran Li is a former village administrator of Gang Dau Yang village in Waingmaw Township of resource-rich Kachin State. He has been sheltering, for the last six years, in Mu Yin camp for internally displaced persons (IDPs). He is one of 100,000 people in Kachin State displaced after a 17-year ceasefire agreement between the Kachin Independence Army (KIA) and the Myanmar Army broke down in 2011. When clashes erupted along the Waingmaw-Laiza highway in 2011 and 2012, villagers fled their homes and farms and have still not returned as the two armies fight over territory. Unbelievably, however, people are profiting from cultivating large-scale plantations on land deserted due to conflict, while those that once worked the land survive in deprivation inside IDP camps. The Irrawaddy found huge plantations around the villages of Shwe Nyaung Pin, Ga Ra Yang, Hsa Mar, Gang Dau Yang, Nansem Yang—inside the conflict zone. IDPs are unaware of the fate of their land—which many IDPs have cultivated for generations but do not always have official ownership documents—and hope to return at some stage. This Irrawaddy reporter took Bran Li and other locals to Gang Dau Yang village, near a Myanmar Army base, in early August. On the road to Laiza we passed hundreds of abandoned houses, some already reclaimed by the jungle. Other concrete structures had been put to use as army fortifications and checkpoints. Journalists are not usually permitted to visit the area, a government soldier told The Irrawaddy that, at night, they see flashes of light, but there have not been any clashes for months. Businesspeople are clearly making millions of kyats from agriculture in these conflict areas: Who are they and how were they permitted to farm the land? 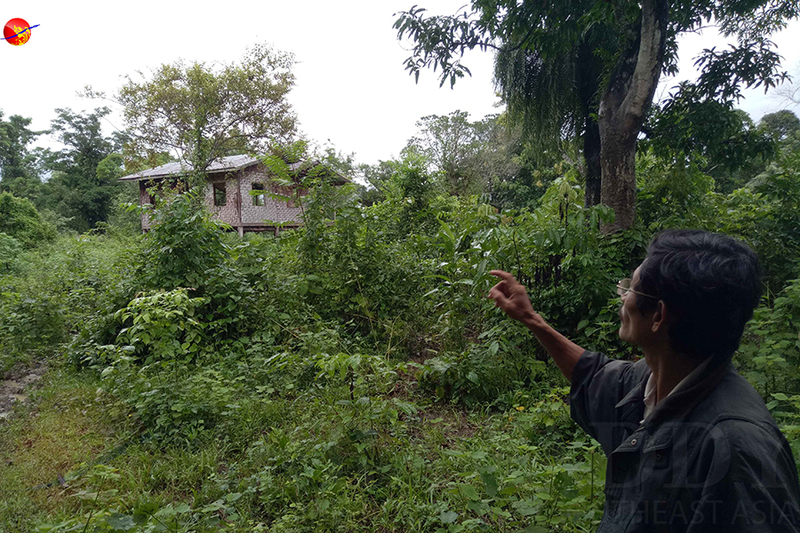 Kachin displaced person Bran Li points out his abandoned house in Gang Dau Yang village in Waingmaw Township. (Moe Myint / Irrawaddy). Over the past six months, The Irrawaddy received classified documents from Waingmaw Township’s Department of Agricultural Land Management and Statistics which shows the previous government issued ownership documents of 170,000 acres of land in Waingmaw Township to companies and individuals between 2013 and 2014 under the Management of Vacant, Fallow, or Virgin Land Law of 2012. The list of owners includes: Former Kachin State chief minister Lajon Ngan Sai, senior KIA official Dr. La Ja, relatives of KIA generals, and Shan Yin Hku company which is owned by Zahkun Tin Ying of the Border Guard Force (BGF) that was previously the New Democratic Army-Kachin (NDA-K). The land permits were issued by the Union government. The list also features a person named U Aung Min. Local community groups told The Irrawaddy this could refer to a former Union minister who founded the Myanmar Peace Center (MPC) but The Irrawaddy was unable to independently verify this. The document shows Dr. La Ja applied for 5,900 acres and Lajon Ngan Sai was granted 2,700 acres. KIA official Dr. La Ja has cultivated at least 670 acres of land and the former chief minister has begun working 530 acres of land, though the document does not specific which crop. Shan Yin Hku applied for 10,000 acres of land and has begun working 3,500 acres of it in Man Dwang and Man Waing villages of Waingmaw Township. 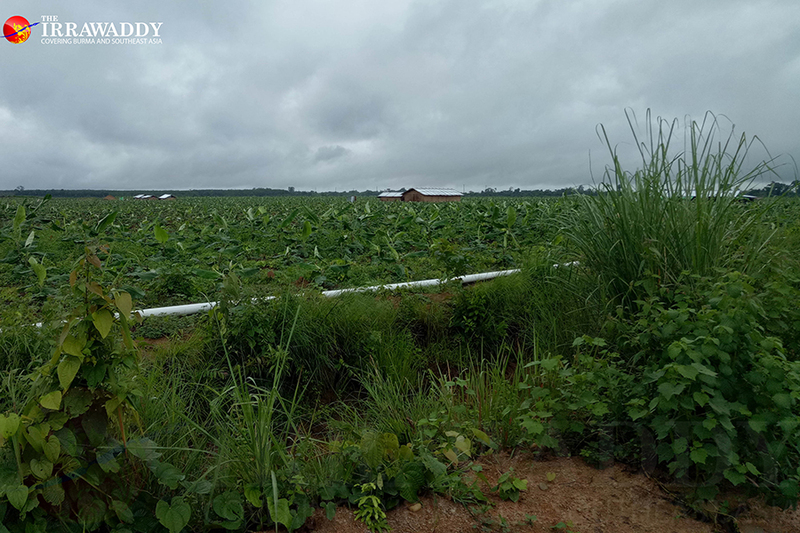 The Irrawaddy spoke to Dr. La Ja in Chiang Mai last month and he confessed to operating 500 acres of plantations growing cassava—used to make tapioca—in Gang Dau Yang but that he later abandoned the land before the government revoked the license a few months ago. His name may still appear on official documents, he said, even though he is no longer operating a plantation. The Irrawaddy was unable to observe the land itself to verify. 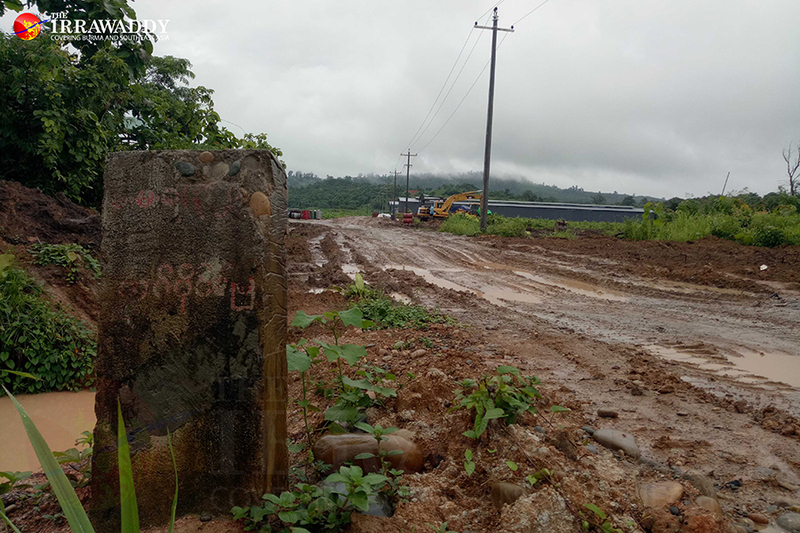 On Aug. 11, The Irrawaddy contacted the land records department of Waingmaw Township in order to confirm the details and implementations of the land, but was refused permission. “It is too dangerous for us [to provide the document], you know the situation here,” said a junior clerk, adding that he was once threatened with dismissal by a cabinet member. A banana plantation nearby Shwe Nyaung Pin village, Waingmaw Township, located on the road to Laiza. (Moe Myint / Irrawaddy). Last month, The Irrawaddy spoke to Kachin State Chief Minister Hket Awng who officially confirmed the list above. According to him, Dr. La Ja received 5,000 acres and former chief minister Lajon Ngan Sai received 2,700 acres of land as approved by the previous government. He said the U Aung Min listed “probably” referred to the former Union minister. Hket Awng explained that individuals and companies can apply to use vacant land but must implement their proposals within four years in line with the 2012 Land Law—failure to do so can result in the land being repealed. He said the Central Committee for Vacant, Fallow, and Virgin Land Management and Kachin State authorities handed over 1.2 million acres of land to companies, armed organizations, and politicians over the past few years with the purpose of decreasing the amount of opium produced in the state. Only 100,000 acres are currently being cultivated, he said. Local authorities allocated land to 525 individuals and businesses while the central committee granted 301 permits. It’s unclear how much of the 1.2 million acres was deemed vacant due to displacement of villagers into camps. The land grows rice, sugarcane, rubber, and bananas, according to local parliamentarian Naw Li who said more than 30,000 acres of banana plantations had been established in Waingmaw Township alone—mostly with Chinese owners producing fruit for the Chinese market. Both the member of Kachin State parliament and the chief minister claimed all such projects were approved under the Union Solidarity and Development Party (USDP)-led government. A sign reading ‘Military-Owned Land, No Trespassing’ nearby Waingmaw town. (Moe Myint/ Irrawaddy). The government acknowledges that planting banana through tissue culture damages the soil quality but ignores the activity encourage more jobs in the area and to avoid formers reverting to poppy cultivation. According to the Kachin State chief minister, 10,000 acres of banana plantations were handed to BGFs and their relatives to halt opium poppy cultivation. The chief minister claimed the National League for Democracy (NLD)-led government had reduced 10,000 acres of poppy cultivation in the border regions to just 3,000 acres, though he had no official data to support this claim. Workers in remote regions such as Che Phwe and Sar Law switched from working on poppy plantations to bananas since 2015, he said. Parliamentarian Naw Li provided a different perspective, pointing out banana plantations did not provide decent revenue and the soil would soon lose its nutrients unless a lot of fertilizer was used. The Irrawaddy met with a banana expert from China overseeing a 2,000-acre banana plantation in Nanwa forest of Waingmaw Township—an area protected by the Forestry Department and close to KIA outposts. After nine years, the soil became so damaged he is now seeking a new location to farm. The project is operated by local businessman U Nyunt Aung but two Chinese workers supervise the plantation and hired 22 migrant workers from Rakhine State. 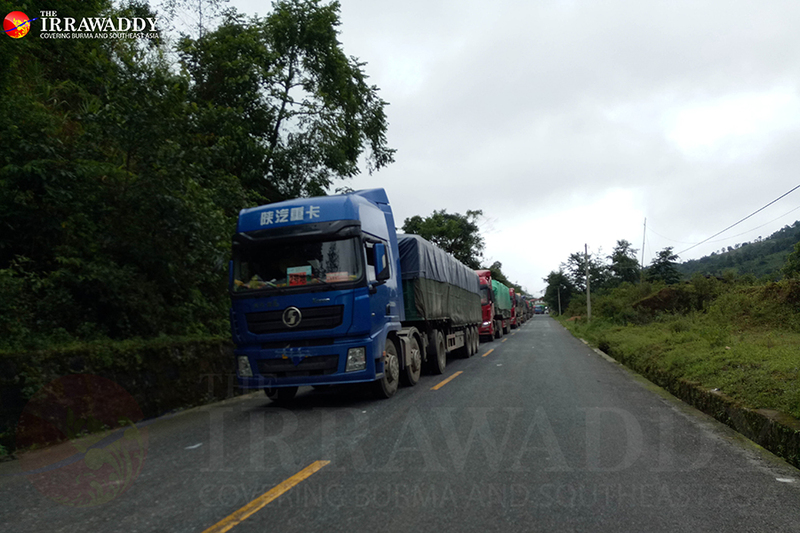 One of the Chinese nationals Xiao Li told The Irrawaddy his boss exports at least 300 truckloads of bananas to China annually, each carrying 20 tons. He sells one banana stalk for 36 Chinese Yuan (US$5.4) across the border in China. Naw Li said the move to cultivate bananas rather than opium poppy did not bring benefits to locals who are not taught new agricultural techniques and said he estimated the state government received just 60,000 kyats for each lorry load of bananas in taxes. Although he agreed with the project’s intention, he said opium fields had not been significantly reduced as bananas are usually grown on flat land with more water, rather than the hills which support poppy crops. “Poppy growers are not interested to work in banana gardens,” said parliamentarian Naw Li. A militia leader in Sudung, Waingmaw Township told the Irrawaddy that opium production has not been dramatically reduced in border areas as locals could not get as much money from other harvests such as bananas, rice, rubber, rambutan, dragon fruit, and cassava. Trucks queue in the border town Sudhung in Waingmaw Township. (Moe Myint/ Irrawaddy). After one-and-a-half years in office, the NLD still do not have proper statistics on the implementation of projects under the vacant, fallow, and virgin land policy. Regional lawmaker Naw Li said even regional ministers are not allowed to enter restricted areas without permission from regional border affair ministers due to safety concerns. “Even cabinet members keen to interact with local people, they can’t reach out to the people on the ground,” said Naw Li. Kachin State Chief Minister Dr. Hket Aung told The Irrawaddy they have received land dispute complaints claiming land belongs to IDPs. He ordered the state office’s secretary to establish a land scrutiny commission in order to establish the amount of redistributed land and how much of it belongs to IDPs. He declined to give a time frame for the scrutiny process and the resettlement of IDPs but acknowledged it could be a growing problem in the area. “Our government is working for peace. The IDPs must return to their origins when we have peace. We will not let official land confiscation happen in future,” he said. 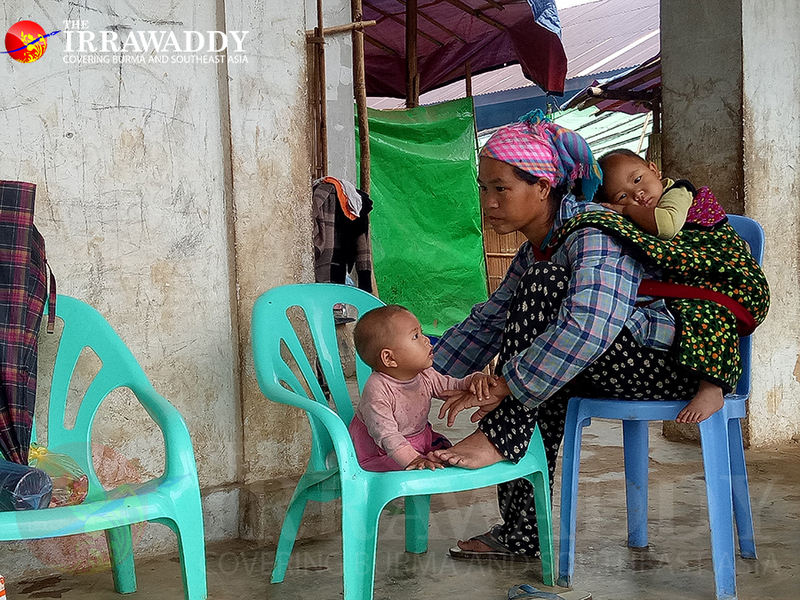 A mother and her daughter in Sudung camp for internally displaced persons, Waingmaw Township, Kachin State. (Moe Myint/ Irrawaddy).